See if you or your husband can get a copy of Richard Mabey's Weeds, a great book on , well, weeds. Those names fill me with an amateur botanist's ecstacy. Looking forward to hearing all about the non-fiction writing course. I have heard of these groups. An old woman who lives across from us in Northcote has cultivated a crop of 'something' that she picks for eating from time to time. It certainly makes sense that the old crops may shoot forth. Here in Lockwood I dug a piece of earth for a garden bed and Lo! tomato and potato plants have sprouted. ( it was once a tomato farm here). I have been wondering whether there is some sort of published guide to edible weeds? The thing to be most careful of with wild plants from old building sites is whether or not the soil is contaminated. Research must be done if you don't want to poison yourselves unintentionally. From other areas such as woods, creeks and fields, just wash things carefully. Most wild things are extremely rich in minerals sadly lacking in the farmed variety. They take great pains to add in vitamins and iron but forget about other trace minerals needed by the body if it is to properly utilise the vitamin content. Although I eat without question whatever weird and wonderful vegetation that finds its way onto my plate without comment or complaint I have never been a great lover of salads throughout my life and those salads I have had have, with the exception of the addition of a light sprinkling of salt, come untreated, no oils or creams or other such gunk. I’m perfectly happy as I’ve said to munch away on whatever my wife sees fit to prepare for me but I can’t say the idea of going outside looking for my own greens appeals much but then I’m not really an outside person as you know. As a kid salads consisted of three items: lettuce, cucumber and tomato. I’m sure my mother knew that there were other things she could have added to the mix but I suspect she restricted what she bought to what she knew we would eat. As it was I refused point blank to eat cucumber with its skin still on although that doesn’t trouble me now. But if Carrie died and left me in charge of my own nutritional needs I suspect that I might slip back into old habits and only buy lettuces, cucumbers and tomatoes. Are there such things as inedible blackberries? Unripe, perhaps, but I’ve eaten blackberries in the wild as a kid and there was never any question of avoiding certain kind; they were all good. As regards your thesis perhaps all you need concern yourself with is presentation as opposed to content. A perfect example are the ‘Idiot’s Guide to…’ books. I had one on Access VBA and it was every bit as good as my ‘proper’ textbooks, better in some cases. Do you know any cartoonists you could collaborate with? (I’m only half-joking.) As far as text books go, yes, I can live with a bit of disorder as long as there’s a decent index at the back. Most aren’t. I just picked up a copy of Edible Weeds and Garden Plants of Melbourne by Doris Pozzi (www.hellolittleweed.com) which is a good introduction to the edible weeds around here. I love the comparison of overworked writing to a manicured garden, needing something old, random, wild, nutritious to pop through and give it life! Good luck with your class. I prefer disorder. I prefer never knowing what's around the corner when I'm writing. It's amazing what can be found growing wild and free and edible. Your husband is right. Did't you find any lamb's lettuce? Also called mache? Years ago my daughter brought a French college fellow home with her. He braved the back 40 and came home with dock and other stuff and added a dish to our meal. One little boy fled the table crying when he saw pansies in the salad. I like the connections made here for getting from the well planned and maybe expected, to something more, maybe along the edge, maybe some unexpected thoughts. The idea of older more exotic seeds waiting for the fads to fade is very enticing. Celebrate Nature's bounty! I wonder if the selection won't decrease after the Springtime. I hope your class will be productive! I'm sure there is an equal amount of edible plants here in southern California but I am 100% ignorant of things like this. But I also appreciated how you were able to apply your husband's wildnerness lesson to your writing. If it's just the same with you, I'll buy my veggies at the store. Good writing metaphor, though. Hard to avoid cliches sometimes. That's why it's best, assuming you have a choice, to write about what you know and care about. Around here, the fiddle heads of ferns are good to eat as are the tender tops and young shoots of nettles that can be cooked or used to make soup. Cooking removes the stinging spines. Chickweed usually grows 2.5 feet tall with small white flowers. The tender leaves and stems can be used raw for a salad or cooked and served like spinach. Purslane is a wild edible that grows close to the ground. It is good eaten raw in a salad, or the entire plant can be boiled in salty water and eaten. It is also a good source of vitamin C and A. Wintercress is a plant that grows 1 to 4 feet tall and has clusters of yellow flowers. The leaves can either be eaten raw or cooked. Dandelion's flowers or leaves can be eaten raw in a salad or cooked as a potherb. Bitterroot is a low growing plant that is 1 to 3 inches tall with rose to cream flowers. To eat the root, boil it and peel off the outer husk. Also tea can be made from Sassafras and wild mint. tonight while walking with my son and his ten year old friend, the friend, marcus, said, here, and crammed some leaves into my hand. we all walked and munched on mint. how brilliant for this little boy to be able to share his wealth of knowledge. truly, i was rather pleased for us all. Purslane is great. It doesn't keep long. If you can get it growing in your garden it is lush and succulent, tangy, and you can pick it as needed. Purslane seems to love the cracks in pavement – parking lots & sidewalks. Its flavor isn't the best when picked from the parking lot. I am trying to get it to live in my garden. So far without success. Not enough sun perhaps? I love how you turned a hat-ful of weeds and edibles into a post — an essay, really. I had to laugh at the "amaranth" — I recently overheard a little girl's conversation here in Los Angeles — her name was Amaranth. I think this activity and this metaphor is AWESOME. elisabeth, a terrific essay–and on one of my favorite subjects. 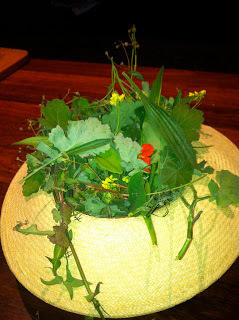 i love to forage, and also took a paid ramble a few years ago in NYC, with a man who is known as Steve "Wildman" Brill. he forages in any green area, parks and other, within the city limits–all 5 boroughs–of NYC. so much fun! i learned all kinds of things about botany; and Steve also tells great jokes, in the energetic & physical spirit of old-time vaudeville comedians. i brought a lot of stuff home, too–but couldnt bear to eat them–they were so beautiful to look at. You may have stumbled onto something. The old lies dormant and comes back. That caught my attention. So did the free salad idea. When we lived on our farm a couple of years ago, a very nutritious vegetable, often for sale in up-marked produce shops, was growing wild. In Holland it was a very desirable vegetable, nothing fancy about it.Its name 'porcelijn'. The greens look as colourful as their names. Oh, how we writers love new words! Good luck with the writing course and momentum for your project Elisabeth. We'll check out Richard Mabey's weeds, Mary. Thanks for the tip and I'll let you know how the writing course goes. 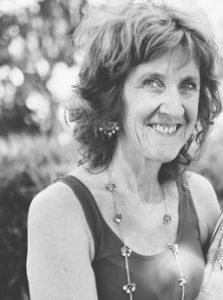 There is a published guide to edible weeds that my husband just bought, Christine, and it's written by Doris Pozzi and available from her at Healesville. It's called 'Edible Weeds and Garden Plants of Melbourne'. You'll find her easily through Google. There's also a book, 'Useful weeds at our doorstep; by Pat Collins. I'm mindful of the dangers of contaminated sites, River. Perhaps I should have made that clear. One of the reasons we never planted vegetables in our front garden is that we live on a busy road with trams and we worried about the pollutants. I gather these edible weeds can are rich in vitamins and trace elements but as you say we can't rely on them exclusively for our nutrition. I don't want to produce a text book, Jim, more a creative non fiction account that makes for good reading. My international heroes include the likes of Janet Malcolm and Joan Didion, but I doubt that I could produce anything of their standard and they to are both journalists and American. Mine will inevitably have an Australian flavour. As for salads, my children berate me for the blandness of my version, like yours: tomatoes lettuce and cucumber perhaps with avocado tossed in for the luxury element. I'm also partial to beetroot. Lately, my daughters have taken to working on more elaborate salads. You know the types. they might include pine nuts, walnuts, celery, or fetta cheese, goats cheese, couscous, raisins etc. And are always mixed together with a finely balanced dressing of oils, balsalmic vinegar and/or herbs. On Sunday night my husband included his most recent collection of weeds in a spanakopita – Greek pie with spinach, ricotta and fetta in filo pastry. We often eat this dish spiced with dill, but this time it was much tastier. You're onto it, Alison. As you say: something from the earth plucked by our own hands, grown locally and without the introduction of commercial control, pesticides and cost, is much more fun. Our life through the plants that nurture us in the soil, Steven. It is thrilling. You and me, we observe and write about such visions but others actually turn the plants to good use, which comes in handy where hunger and nourishment are concerned. I mentioned lamb's lettuce to my husband and he's heard of it; not sure that he found any though. I'm glad you too like a touch of disorder. It makes life more interesting. Pansies in a salad, Joanne. I know that experience and I can understand our young son's distress at the idea of eating them. Though the flowers I've eaten in my time, including pansies, nasturtiums and sugared violets, have been delicious. I couldn't agree more, Anthony. As you say, 'The idea of older more exotic seeds waiting for the fads to fade is very enticing'. It's springtime for you, Ms Sparrow perhaps, but for us here in Australia it's autumn. It seems these plants/weeds are available throughout the year though different varieties tend to pop up their heads at different times. -K-, you might take to photographing the intricacies of plant life one day. That'd be something. In the meantime thanks for your generous comment here. I can understand your reticence about these wild 'veggies', Kirk. At least at the store you think you know what you're getting, whereas out in the wild it can seem to be anyone's guess. You sound very much the expert on these matters, Syd. Thanks for all these recipes. Whenever I read recipes like this I think of the hardship people endured during WW2, and of how my mother used vegetables and plants of all sorts, including tulip bulbs, to make soups. Now such off shoots/weeds/plants can be a delicacy. As with writing, food fashions change with circumstance and need. Mint's a particularly generous herb, erin, as you say there at our feet, and ready to be enjoyed if only we look below our navels to the ground. I'm glad the writing analogy worked for you. We have purslane growing through the cracks in he bricks in our backyard, Glenn. My husband urged me to try it although the sample he collected was not so lush at this time of the year. It tasted okay. I'll have to get more adventurous with these things, as I'd like to get more adventurous with my writing. A hatful of weeds is a good way to describe it, Elizabeth. And yes, it's amazing what you can do with the unexpected things you find, in life as much as in writing. No morels in Australia, Omgrrrl, at least not as far as I know and certainly not locally to us. More's the pity. I'm glad the metaphor worked for you. It's funny, Susan, I have an attitude similar to yours to vegetables sometimes: too beautiful to eat. At the moment we have this almost perfect pumpkin sitting on a chair in our kitchen. One of our daughters brought it home from her workplace and I just cant bear to cut into it, much as i love pumpkin to eat. This pumpkin looks so exquisite right up to this knobby stem at the top and the dark green striated skin. It sounds as though foraging is alive and well everywhere, including in NY. Who'd have thought it possible in such a densely built up community, but I understand it can happen everywhere, except perhaps in the snow covered Arctic and Antarctic. There are probably a lot of things in the wild which we can eat. That man who eluded police for many years must know a thing or two about bush-tucker. It's always good hear from you in Boston, Mim. Thanks. Free salads and the past recycling itself are powerful notions, Heidrun. I'm glad they resonated for you. 'Porcelijn' is a fantastic name for a precious weed to my English speaking ear. I wonder what it means, Gerard. And thanks for clarifying your ID here. I know who you are from your blog, Gerard, but others might not: My new Dutch born blog friend from Sydney. I suppose words are the bread and butter of our craft, Juliet, as you suggest. I love the way you pull these two experiences together. It's good to see you here, Gwen. I'm glad the juxtaposition worked for you with your keen visual artist's eye. I'm afraid words are all I have. Thanks for that link, Adam. You never know, you might yet attract a few more bloggers to this wonderful and worthwhile activity, called foraging. Great post. Thoroughly enjoyable. The heritage plants taking their opportunity to re-establish themselves, strikes me as a good opening for a writer. It seems as if both you and your husband are truly inspired at this moment … follow your inspirations as there is nothing like the joy that comes of so doing. Hope you are even more inspired when you attned your class! Looking forward to hearing that the book of your thesis is on its way! A belated thanks for the reference to the Willylitfest, Robert. It sounds like a fantastic event. Heritage plants from the past waiting their chance to re-emerge provide a good beginning, as you suggest Dave, and perhaps not only for a writer. I'll write more on my non-fiction class, Aguja, when I get a chance. I now have mixed feelings about it, hopefully not as a set back, but we shall see. In the meantime thanks for your good wishes here.